Labour induction generates strong feelings. Parents who lose a normal baby near term (37-42 weeks) understandably wish someone had induced birth earlier. Natural childbirth enthusiasts counter that induction increases pain, Caesarean sections and medicalises childbirth. Both have a point, although the supposed effect on Caesareans may be overstated (click here). Today I want to consider another aspect of the debate, the way in which the risk of remaining undelivered varies with gestational age. 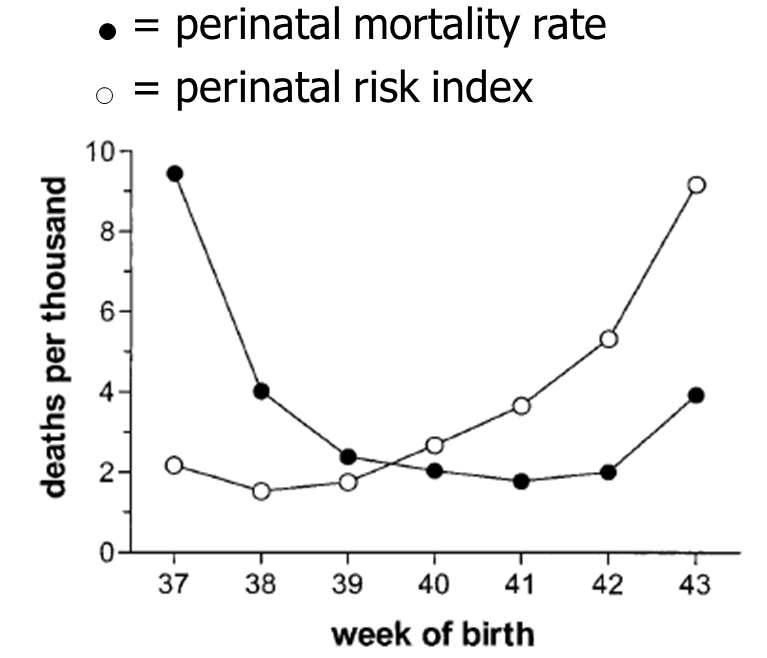 Many critics of induction use graphs of perinatal mortality by week (e.g. solid dots above) where the risk only rises after 42 weeks, to imply that induction at say 40 or 41 weeks is illogical because the risk is not raised at these gestations. But such graphs mislead. They express mortality as deaths per 1000 total births. i.e. the denominator for later deaths includes babies who are already safely delivered. This makes no sense if we are concerned about stillbirth because a delivered baby cannot be stillborn. The correct denominator should be babies still undelivered at the particular gestational age. As this proportion falls after 37 weeks so the risk of stillbirth per undelivered baby starts to rise. But plotting only stillbirth risk is also misleading because babies may also die after birth from complications of labour or prematurity; delivery at 24 weeks would prevent all stillbirths but would hardly be sensible. The data we need are the rates of all deaths per 1000 undelivered babies by gestational age at delivery – the perinatal risk index (open dots above). The idea takes a bit of getting your head around. The person who explained it to me was Gordon Smith from Cambridge. He has written about it many times. Click here for his paper, from which I nicked the graph. Or here if you have access problems Gordon Smith perinatal risk index paper. The fact that 38 weeks is the safest gestation to be born doesn’t automatically mean we should induce everyone then; wrong dates might cause prematurity related problems. But 42 weeks is too late. For accurately dated pregnancies induction at 39 or 40 weeks would prevent many deaths. If it didn’t increase Caesareans, what’s not to like? ← Where’s my open access amniotomy trial? Let’s play devil’s advocate for a second. Of course I see your point and I agree. Live babies are the goal, 39 weeks is long enough, and no more Caesareans is wonderful. But: for some women there are other factors that have importance. They want to go into labour spontaneously. And/or they want a home birth. Or they don’t want the CTG associated with induction. Not everyone attaches the same importance to certain things as we (the ob’s) do. The gain, after all, is significant but not huge. It is not like you are risking your child’s life to an inordinate degree by wanting to wait until 41 or even 42 weeks, provided you are frequently monitored and induced at the first sign of trouble. So it all depends on what weighs more for the individual woman. A very small but significantly higher chance of ending up with a live baby, or the chance of the birth she had her mind set on. Oh I know that things don’t always end up the way you had in mind, but at least there would be a chance. It’s an individual choice. But we can certainly use this data in our counselling, and midwives should as well. You’re right. Until someone does some decent trials we shouldn’t be offering induction at term. But pushing women to wait till T+14 is surely too long. And it’s not obviously wrong to acceed to an IOL request at 40w, is it? I do it all the time. Oh, me too. In fact, I did it myself, both times. But, after she has received all available information, the patient should decide.